We are in the middle of my favourite season, the monsoon. As I write this, there is a lull but the met promises rains back again from later this weekend. 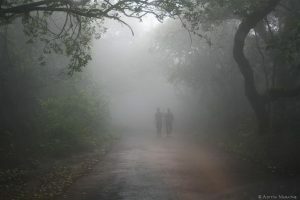 The monsoon in Pune starts by the first week of June and goes on till about the middle of September every year. It is vital for India as our agriculture and drinking water needs are met by the water that arrives during the season and a failed or below normal monsoon is disastrous for us. Right now, everything is green everywhere including my little garden. I love to sit in our veranda and watch the rain fall and the birds taking shelter in our garden. When we go out, we see all the trees happy with the rainfall as also the grass on vacant plots. 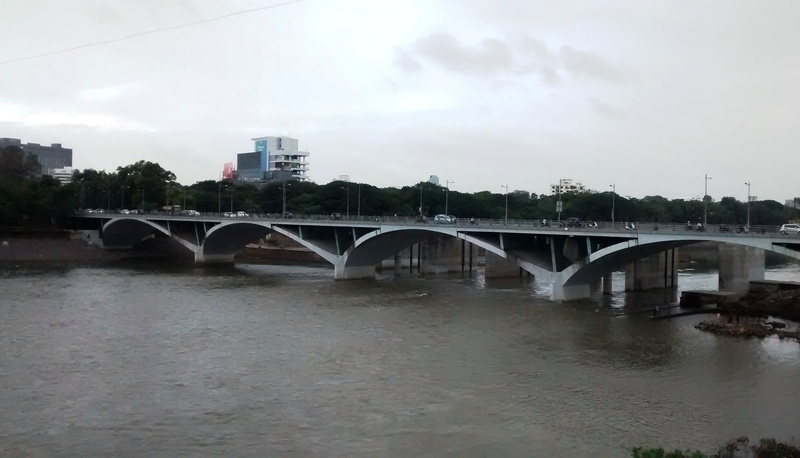 Since Pune is situated at a height of 560 Mts from sea level, it is not subject to the debilitating climate of the coastal areas and it is always cool and comfortable during the monsoon. Lovely weather to be in. 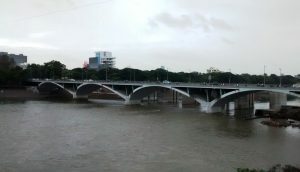 This is the Mula-Mutha river that runs through Pune which is just about 300 Mts away from my home. Like shown in the picture, it is now in full strength and I always love to see it in this form. During the summer months this comes down to about a fifth of its size but the river runs with water all the twelve months.During the nineties my son and I used to go fishing for river carp and catfish in it but as the city grew and the population grew, we gave up that sport. When my late wife was alive, we used to go to Mahabaleshwar once definitely and often twice during the monsoon to enjoy the experience of walking through the clouds and eating hot fresh off the charcoals corn on the cob called bhutta here, hot samosas and tea there. It was just a three hour drive at most and we used to thoroughly enjoy the getaways. Since her death, I just don’t have the inspiration to do that. During the monsoon there are many festivals as during this period agriculture takes a break and the farmers used the occasion to celebrate festivals. The crowning one will be the Ganesh immersion scheduled for the 15th of September this year. It will indicate the end of the monsoon season. This topic for the weekly Friday LBC post was chosen by me. You can see what the other LBC blogger Shackman has to say on it at his blog. This entry was posted in Blogging, Nostalgia and tagged Bhutta, Mahabaleshwar, Mula-Mutha river, Samosa. Bookmark the permalink. 23 Responses to My Favourite Season. I think that too would be my favorite season. I love the thunderstorms here but the season is not nearly so long. The side trip sounds wonderful as well. Just imagine motorcycle rides into the clouds Shackman! Beautiful account of your favourite season, thank you. I love walking in the fog too: it’s mysterious and soothing at the same time (the moist probably reminds me of the safety of the womb? Freud would certainly explain it). Have a blessed weekend and enjoy the monsoon. Thank you Max. I am already enjoying the weekend but for us retired old codgers, life is one long weekend! Love hearing about life style in India. Monsoon being your favourite. Here it would be fall for me.. in Ireland it was always the spring. I can understand the spring in Ireland, but not having experienced fall in Canada, I can only imagine what it will be like! Autumn is my favorite season. The rainy season, when we have one, is second. We do love the rain! Many people in the North Americas seem to like the Autumn. I wonder why! I miss the very cold. I miss the snow cracking and crunching, but not giving, under my mukluks. I miss the way it sparkles blue white and how the air smells. Wet, very cold, and so clean. I miss the cold. Here we do get snow, but it’s dirty city snow with ruts and greasy areas and because it melts and refreezes, which does not happen in the far north, it’s treacherous, ugly and smells of car oil. I too like rainy seasons. Only problem we see in India roads with potholes. Even in Mumbai the roads are horrible these days. 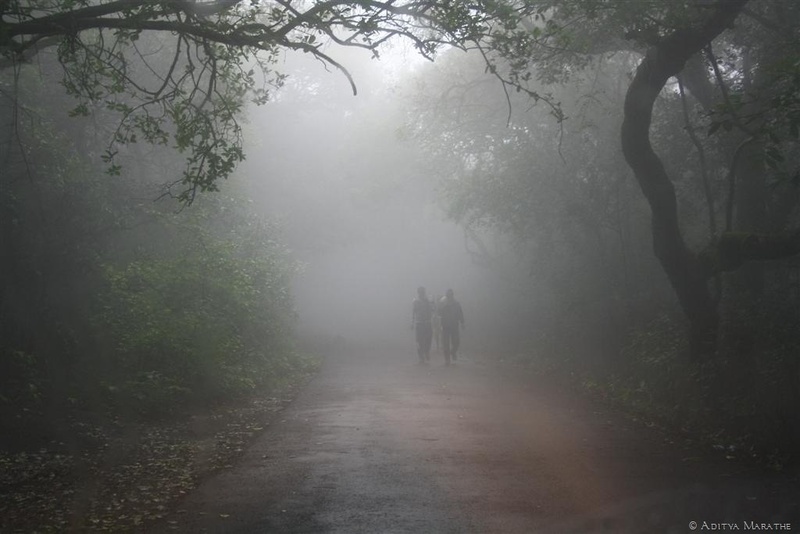 Mahabaleshwar is good in winters too specially for those who are in bigger cities. I used to love the summer heat, but as I get older, it’s really uncomfortable for me. We are in the middle of a hot spell (30 degrees F), which is not that extreme, compared to other places in the world, but still, I don’t like it! I’ll be glad to see our moderate weather return! I’m in the Pacific North West, in Canada, by the way. A friend of mine from the UK says that she wilts in the summer there! When I tell her about our summers, she shudders! rain lover that i am this post is after my own heart. i could see it and feel it the whole time i read! and it’s a special memory of urmeela. all the more precious to you. as i write this we FINALLY got a little rain last night. i awoke to hearing it. and now i will go back and follow all your links! thank you. I’m not sure I could cope with monsoon length – but it does sound enjoyable the way you have written. I like “mild with some sun to warm up the place” – we do humidity in Auckland (2 harbours = 2 seas) which also means thick fogs from time to time. Got a number of cupboards completely sorted out – and finding that the bathroom supply cupboard quite mildewy! I wish you all the very best in your new home. My favourite season has to be summer, as it’s generally warm and dry. In the winter when it’s cold and wet I can’t wait for spring to come around. But at least we don’t get monsoons! Nick, you have got 12 months of rain in a year!! It’s rainy here today and I love the sound of it. And how lush and green everything looks. Secret Agent Woman recently posted..War on weeds. The sound of falling rain and the smell of it never fails to generate good feelings in me too. Isn’t it strange that nearly always in (Hollywood) movies the monsoon is depicted as a disaster ? … We could do with a mini-monsoon here in SE England right now. There are disasters too every year but, overall, the benefits far outweigh the disadvantages of the season. I am sure I do have a “favourite” season. Which one? I don’t know. Though, I suppose, in absence of snow at the English South Coast, winter has become my least favourite. Where once, in my youth, winter was full of excitement it’s now become the season of indifference. I associate spring with hope and anticipation, summer with fulfillment, autumn with harvest, a welcome melancholy and putting things to rest. So, you are a person for all seasons!